CANADA: The excellent work of a special security team has been recognised by the Canada Border Services Agency. The presentation of Certificates of Appreciation was made by Philippe Girard, Migration Integrity Officer, with the Consulate General of Canada in Dubai. The Document Check Team, part of Emirates Group Security (Airport Unit), was created when Emirates launched flights to Toronto, Canada, in October 2007 and since then it has been kept busy thwarting illegal and improperly documented travel. The implications of not doing so are severe. Apart from damaging the company's image as a responsible airline, carrying such passengers can result in a fine of CAN$2,000 (Dhs6,966). Dr Abdulla Al Hashimi, Divisional Senior Vice President Group Security, said: "People are the backbone of any industry and aviation security is no exception". "The Document Check Team has been instrumental in combating illegal immigration by carrying out their task with aplomb". "Last year alone, their vigilance here in our hub, recorded a saving of Dhs48.2 million in potential fines for improperly documented travel across the network, including forged documents and visa-related issues. 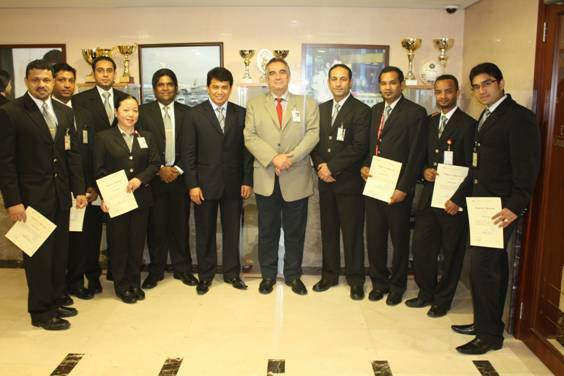 I congratulate all the team members and encourage them to keep up the good work". Outstanding (l to r): Uddhar Manohar, Security Officer; Security Co-ordinators Suresh Dethan, Salim Saleh Bawazir and Lucy Tangyun; Jacob Rajan, Security Controller; Zack Zainal, Vice President Group Security; Philippe Girard; Ali Reza Tehrani, Security Controller; and Security Co-ordinators Mohd Nikab, Ashenafi Yared and Keenan Jaggi.